Should Community Colleges Offer Four-Year Degrees? It’s now possible to get your bachelor’s degree from local community colleges in some states. Find out why some people find this controversial. As you weigh your options, make sure to consider your ultimate career goals in order to find schools and programs that are truly right for you. The education world is changing and the role of community colleges is starting to change with it: Depending on which state you live in and what subject you want to study, you may no longer need to attend a four-year college in order to get your bachelor’s degree. In fact, as many as 21 states have made it possible to receive certain bachelor’s degrees from community colleges. The idea behind this proposal is that it will cause more students to graduate and be equipped to enter the workforce. Michigan just recently agreed to allow junior colleges like Macomb Community College to offer four-year degrees in certain specific fields, like culinary arts and maritime science. They decided to do this because these areas of study were in high demand, but few four-year universities offered tracks in them. Others that offer four-year degrees include Miami Dade College in Florida and Bellevue College in Washington. Similarly, lawmakers in Colorado are currently pushing for a bill that would allow community colleges to dole out four-year degrees in certain fields, provided they can prove that there’s a demand for the program and that it doesn’t already exist at surrounding four-year schools. Some possible programs include dental hygiene and mortuary science. The bill aims to broaden opportunities for students who otherwise wouldn’t be able to attend a program in their chosen field. California also is currently considering a controversial proposal to allow community colleges to offer four-year degrees. The idea behind the proposal is that it will cause more students to graduate and be equipped to enter the workforce. It’s also meant to benefit people who live in rural areas that don’t have access to four-year schools. 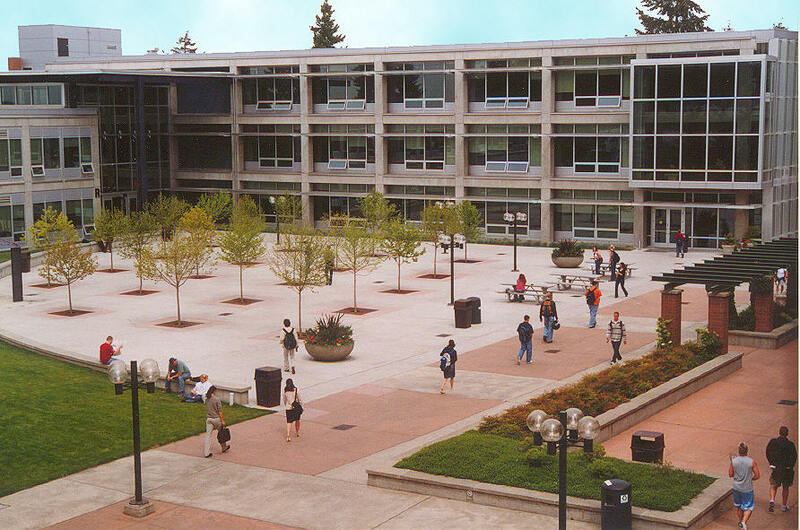 Bellevue College in Washington offers four year degrees for some programs. The argument against these bills is that it will change the current mission of community colleges. Community colleges were designed to provide a platform for anyone to get an education, especially people who are in a transitional period, planning on transferring, or focusing on certain specific careers. Four-year universities, on the other hand, were designed to focus on research and higher degrees. Some people in the education world think that the distinct differences between community colleges and four-year schools should be preserved. However, as the education and job market both change, the needs of students are changing, too – for instance, getting hired with an associate’s degree is harder than it used to be. Many companies now want to hire people who have bachelor’s degrees rather than associate’s degrees, so the demand for four-year degrees has risen. Some argue that as the demand rises, the amount of opportunity should rise too. Under that logic, adding four-year degrees at junior colleges makes sense. Similarly, some high schools are beginning to offer associate’s degrees in an effort to better ready students for both college and the workforce. At these schools, students have the option to get both a high school diploma and an associate’s degree. This way, they can join the workforce right out of high school, or they can continue on to college better prepared academically. High schools that offer these programs include City Polytechnic High School of Engineering, Architecture and Technology in Brooklyn and Travis Early College High School in San Antonio, TX. Ultimately, this all means that you have more opportunities in pursuing your education. As you weigh your options, make sure to consider your ultimate career goals in order to find schools and programs that are truly right for you. Are Community Colleges the Future of Higher Ed?